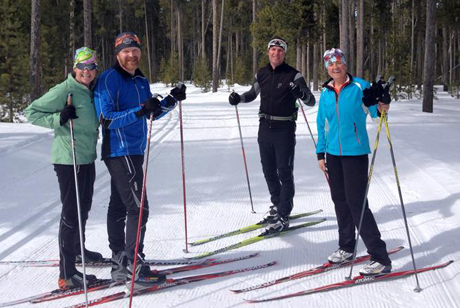 Ever wanted to cross country ski in Yellowstone National Park? Freeheel and Wheel is the trailhead to adventure specializing in cross country skiing, bicycling, fashions and accessories. There are also lessons, guided tours or bike rides, and rental equipment. The storefront is located in West Yellowstone, a half block from the west entrance to Yellowstone National Park. Freeheel and Wheel is the best cross country ski and bicycle shop in West Yellowstone for equipment selection and softgoods for the outdoors and it has an espresso bar. Lessons and guided ski trips will accommodate any schedule from one hour lessons to all day excursions. Skiing techniques (classic, skate, backcountry) and different levels of lessons are available as are custom guided ski or snowshoe trips. Guided ski trips are $30 per hour per person for private outings and groups (2-5 people) are $25 per person per hour. Ski lessons are $50 for private. For 2 people it is $40 per person and for more than 2 people it is $35 per person. Rental equipment: Touring, skate or backcountry ski package (skis, boots, poles) $10 per hour or $25 per day. Classic skiing with waxable skis for groomed trails is $10 per hour or $30 per day. The Backcountry equipment provides a wider, metal edged ski and heavier boots and bindings. Snowshoes are $10 per hour or $25 per day. Here is a link to a page of sample trail outings http://www.freeheelandwheel.com/ski-locations--maps.html including Rendezvous Trails in West Yellowstone, and a selection of local trails and trails suggestions in the national park such as Specimen Creek Trail, Fawn Pass Trail and Bighorn Pass Trail. Self guided ski tours are also available for Yellowstone and Grand Teton National Parks via GaperGuide.